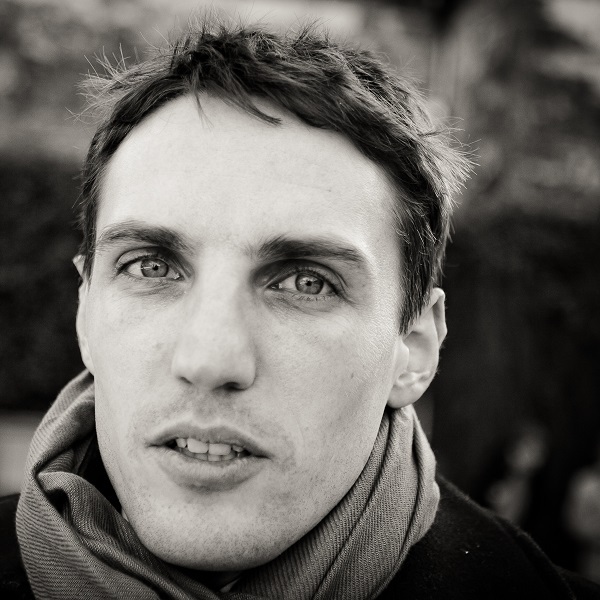 Our guest today is Matthieu Maudet, illustrator of A Well-Mannered Young Wolf. Maudet and author Jean Leroy began working together on comics in 2005 and produced their first book together in 2008. 1. How did you choose the colors in A Well-Mannered Young Wolf? After settling on the characters and making a first sketch for the book, I go searching for the colors, the ambience—that helps me define the layout. I love to limit myself to five or six tints and make sure that everything works together. The wolf here is yellow, for something different from the traditional gray/black. He’s lighter and that makes him seem younger, I think. There has also been for quite some time a little yellow pig that gallops around a corner of my mind—one of my oldest memories from the children’s book Porculus. Maybe he’s there for a reason? I also needed a red to announce the attacks of the young wolf. It’s a little like the music from an animated movie: when a bad guy enters the scene, there is often a theme that precedes him discretely. Here, when the wolf is hiding, there is a little bit of red, then a lot of red when he throws himself at his prey. And at the end, when the wolf follows the boy, the horizon is more and more red—something’s definitely about to happen! 2. 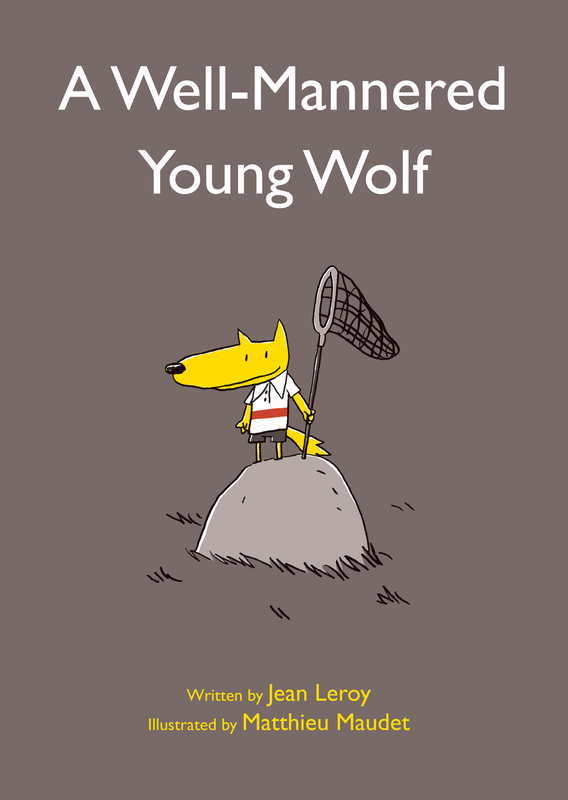 What challenges did you face in illustrating A Well-Mannered Young Wolf? For the main character, it was to make him young, to choose his clothes well so that he seemed polite but not too rigid. He had to seem nice. The rabbit and the chicken are less well-dressed, and they are less polite. With the layout, the most difficult thing was to show the young wolf’s returns to his house without taking three pages each time. I really love this kind of challenge. 3. What were your favorite pieces of art when you were young? I didn’t go to the museum much when I was a child and we did not have any art books at our house. If you had asked me then, I think that my kind of art was comics. I read slowly, but I borrowed piles of them from the library. I was fascinated by the drawings. 4. Which book(s) would you/did you/will you make a point of reading to your own children? Mine, of course!!! Haha. No, they already suffer from those while I am working on them! For picture books, there are some indispensable authors : Chris Haughton, Benjamin Chaud, Oliver Jeffers, Jon Klassen, Kitty Crowther, Edouard Manceau, Germano Zullo et Albertine, Olivier Tallec, and a bunch of other classics, of course! In fact, I believe that what I really love is to see them open all these books with appetite. For all the rest, I trust them to figure it out. They’re the ones that will form their own preferences. 5. What’s the best advice you can give to aspiring illustrators? Open your eyes! Look at everything, everywhere, the little things, the big ones. Draw them however you can and, above all, however you want. And my secret: I draw socks. Lots of socks!!! Read the starred reviews of A Well-Mannered Young Wolf from Publishers Weekly and Booklist, and order the book at Eerdmans.com. You can also read our Five Questions interview with author Jean Leroy here on Eerdlings.